I made a new foal to look at the new talents, since I just downloaded the new update yesterday. Now from what the wiki has told me, I'm supposed to race Sunlit Chaser and beat his time. However, I cannot seem to beat him, seeing as he doesn't move from his spot at all. I have no clue if he is supposed to, or how exactly to do the race. I fly through the hoops and hit the exclamation points, but I still do not win the race, and my quest log in the journal keeps adding the same objective of Beat Sunlit Chaser in a Race, as well as blank tasks. The way I saved the game to my task bar, it opens straight up to the login screen of the game. I started the flying quest last night but barely had time to mess with it until I had to get off. I started off where I left last night, at the flight course, and tried to race Sunlit Chaser again. After about three times of gaining the same result, I flew off to the balloon and went to Cantermore. I just used it to go and come back to Cloudopolis, and when I did come back, the entire journal reset to Speak with Sunlit Chaser. 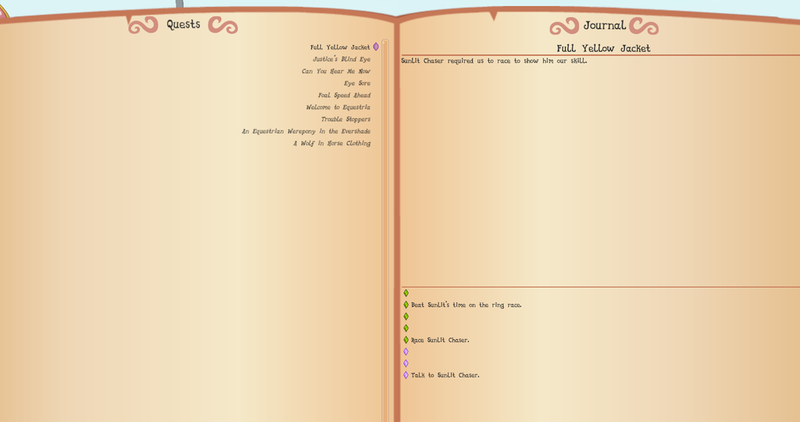 I did as instructed and once again my journal keeps adding the same objective and blank tasks in the quest log. https://img00.deviantart.net/91a6/i/2018/299/4/c/bug_by_alexdoodlez-dcqeotp.png This is a screenshot from today, after the journal had started adding in the objectives after the reset. This was a bug with that build version. It has been fixed in more recent builds.